A few years back, my previous congregation, Temple Israel of Great Neck, celebrated the 50th anniversary of the publishing of Rabbi Mordecai Waxman’s seminal work, Tradition and Change. Rabbi Waxman had been the rabbi at TIGN for an astonishing 55 years, from 1947 until he retired in 2002. The book’s title (apparently coined by his wife Ruth) became the de facto slogan of the Conservative movement. Since the book was published in 1958, the world has changed dramatically. Consider just one thing: technology. The ubiquity of small computers for personal use has changed our lives in ways that are so profound that many of us cannot even imagine a world without them. And of course, the Jewish landscape has changed as well. Jews have many more options today for their Jewish involvement, including, of course, the option of opting out entirely. When Tradition and Change was published, the Conservative movement accounted for half of American Jewry. Today, demographic studies suggest that about one-third of affiliated American Jews are members of Conservative synagogues. And the number of Conservative synagogues is going down as smaller congregations merge or close. A commitment to Kelal Yisrael. Rabbi Waxman uses Rabbi Solomon Schechter’s term, “Catholic Israel,” the idea that all Jews are one people, united by common texts, rituals, and values, a common language and shared history. Positive-Historical Judaism: This is a concept that originated in the 19th-century German-Jewish sphere, that our approach to Judaism is at once aware of the historical changes within Jewish law, halakhah, and custom, minhag, and that we emphasize our connection with history as we look to the future. Acceptance of modern thought: Our approach to Torah demands that we open our minds to the changing currents of science, philosophy, archaeology, Biblical criticism, and so forth, and not ignore them or obfuscate when they challenge accepted tradition. Authority and interpretation: We are bound by Jewish legal tradition, and our reading of halakhah depends on the classical methods of interpretation that Jewish scholars have used for millennia in different lands. And yet we are able to make serious changes in halakhic practice based on our engagement with modern thought and values. I believe firmly in this formula. Growing up attending a Conservative synagogue, I knew that although driving a car to synagogue on Shabbat would violate several traditional Shabbat prohibitions, nonetheless the Conservative movement had decided that it was more in the spirit of Shabbat to drive there than not to go to synagogue at all. No matter the numbers of the Conservative movement, we are still here. And we still stand for the principles of Tradition and Change – of the approach to halakhah / Jewish law, as halakhic decisors have guided it for centuries. The Conservative movement has changed in the last half-century. In particular, in the 1950s, the extent of egalitarianism in American Judaism was mixed seating. I think we have also witnessed a change in Conservative clergy. The Rabbi Waxman model was rabbi-as-academic-scholar. Today’s Conservative rabbis and cantors are scholarly, yes, but are also expected to make personal connections and work harder at community-building initiatives, to focus on pastoral care and engaging contemporary Jews in new ways. And, of course, the Conservative laity has changed dramatically. While the bulk of Jews in the Conservative pews in 1958 were immigrants and children of immigrants, today’s membership is in a different place. We are largely not naturalized Americans. We are simply Americans. The State of Israel is a given, and its influence both in the Jewish world and out is far greater than its size. Attendance at synagogue services is way down. Sermonic pyrotechnics and cantorial recitatives that moved congregations of the last century are rarely heard, let alone appreciated, by Jews under the age of 60. And American society has changed dramatically as well. Formality is out; digital interconnectedness is in, even while our actual, physical interconnectedness (that which sociologist Robert Putnam calls “social capital”) is down. Personal choice is our highest ideal. Membership in organizations of all kinds, including religious institutions, is declining. Intermarriage of all kinds is commonplace; homosexuality has moved into the mainstream. While most Jews will never commit to the halakhic expectations of Orthodoxy, most still want some kind of Jewish experience, and many of those, when they come for their Judaism fix, they want it to be traditional, and yet open to contemporary thought and sensibility. Consider the recent Conservative publication, The Observant Life. 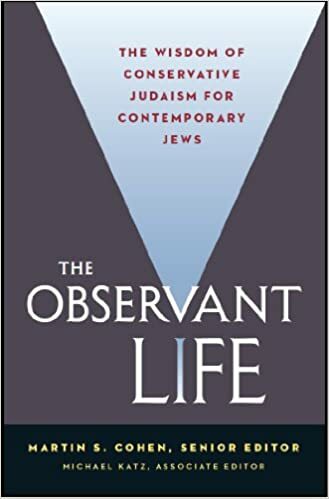 Meant as a successor to the classic halakhic work by Rabbi Isaac Klein, A Guide to Jewish Religious Practice (1979), The Observant Life contains all you need to know not only to practice the ritual aspects of Judaism (kashrut, Shabbat and holidays, daily tefillah / prayer, mourning practices and so forth), but also includes chapters on such non-ritual topics as business ethics, civic morality, sexuality, intellectual property, caring for the needy, and so forth. To ask ourselves serious questions about why we do what we do. You will hear me frequently quote Dr. Ron Wolfson, professor of education at the American Jewish University. Dr. Wolfson has observed that although most synagogues have “Da lifnei mi atah omed” / “Know before whom you stand” written over the bimah, most of us think that what it says is, “Because that’s the way we’ve always done it!” In re-examining ourselves – our services, our programs, our schools – the question, “Why are we doing this” can never be answered with, “Because that’s the way we’ve always done it!” This is not an acceptable answer.On the contrary: rabbinic tradition requires us to ask questions, and the Jewish way is to come up with good answers. Sometimes, “Because it says so in the Torah,” is sufficient. But that is never really the answer. Why do we say the Shema twice a day, evening and morning? Because it says so in the Shema itself. But the real reason is because it keeps us focused on the big picture: loving God, teaching our children, and keeping the words of Torah around us at all times. We are all ambassadors for Congregation Beth Shalom, and that means that we should all be promoting this congregation, what we do, why we do it, and the benefits of belonging. We should all be reaching out in particular to those who have left to welcome them back, but also to unaffiliated members of the community to make the case for belonging. For people to join, this has to be a place that they would want to join. And that means that at every opportunity we need to welcome people in. We need a group of greeters – people who are skilled at making others feel welcome, and to do so not just at services, but at all events in the building.On a related note, I am aware that on some seats in the Faye Rubinstein Weiss Sanctuary, there are names. However, there are no names here or in the Helfant Chapel or in the Homestead Hebrew Chapel. What that means is that no seat belongs to anybody. So if a guest is sitting in what you think is “your” seat, please greet that person kindly, and sit somewhere else. There is nothing more awkward and humiliating than coming into an unfamiliar synagogue and immediately being told to move. We have to be open to all the types of people who come in here. Gay, straight, transgender, Jewish, not yet Jewish, in-married, inter-married, black, white, Asian, Hispanic, single parents, and so on, and so on. The changing face of America is not just in New York and California, it’s here too. We are not in a position to make any judgments. We must welcome all who come here with open arms. To think relationally. This again courtesy of Dr. Wolfson’s most recent book, Relational Judaism. We live in a very impersonal world – anybody who has ever had to call a customer service number knows that. But the synagogue must be a place that builds relationships; the Greek etymology of the word “synagogue” is “place of coming together,” and is a direct translation of the Hebrew, beit kenesset.What makes a group of Jews a beit kenesset? Personal relationships. This is a place where relationships are forged. We have to work harder to build stronger relationships among ourselves, and to create them with others. And that means thinking relationally. The true measure of the success of a program, says Ron Wolfson, is not how many people there were or whether or not they liked it, but rather how did it build relationships between people? All of this will require that we work for change, that we stretch ourselves a bit, perhaps beyond what is comfortable for us. But from my vantage point of having just arrived, I can see no other way forward. Today in Parashat Shofetim, we read about the commandment to the (at this point theoretical) Israelite king that he must keep a copy of the Torah next to his throne. Nobody is above the words of the Torah, the words of God. But a flesh-and-blood king deals with real problems; he must be engaged with society in real time. The Torah is not to keep him in the past, but rather to help him confront the present. When Rambam was asked why he rejected astrology, when the rabbis of the Talmud clearly believed in it, he answered by saying that our eyes are in front of us, so that we look to the future, and not to the past. We will continue in the spirit of Tradition and Change, and change we must if we are continue to provide a home for the much-needed Jewish middle ground. One final note: the United Synagogue of Conservative Judaism is holding its biennial convention in Chicago, Nov. 15-17, where members and professionals from synagogues from all over will gather to learn tools for communal change. Our president Dave Horvitz and I will be there, and Rabbi Waxman will be there in spirit. Please let me know if you will be coming. Join us as we look to the future, and consider how to move forward. Shabbat shalom!